Celebrate St George’s Day by toasting glasses of Gallo Family Vineyards Patron’s Punch. Just like our patron Saint this cocktail is rich with flavours of cherry, pomegranate and raspberry. When serving with food, keep the menu quintessentially British, treat friends and family to a mini fish and chips starter, a main course of traditional Beef Wellington followed by Bakewell Tart for dessert. A red wine best served chilled, Gallo Family Vineyards Summer Red has a refreshing, fruitier, taste that has been blended for people who want to drink red wine, but feel the traditional offerings on the market are too rich and warm for their taste. 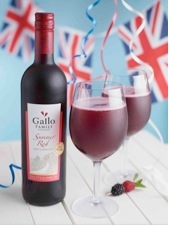 Gallo Family Vineyards Summer Red is a refreshing wine for all seasons and occasions. be that environmental factors come into play as well and interact with those genes.